Alaska was once thought of as a folly. It would soon become a vital investment for the United States, as the purchase allowed for an expansion at the cost of just two cents per acre. Russia and America completed the purchase agreement in 1867. The land what eventually become the 49th state in 1957. What many people do not realize is that Japan actually occupied two Alaskan islands during World War II for 15 months. They used Attu and Kiska has a potential launching point if they were ever going to try to invade the continental 48 states. That never happened, but it is an interesting part of U.S. history that isn’t always taught in history class. Alaska is also a state of mountains. 17 out of the 20 highest peaks in the United States are found here. The most notable of them is Mt. McKinley, which is the tallest mountain in North America at 20,320 feet. If you are thinking about living in Alaska sometime in the future, then here are some pros and cons to consider before you finalize that decision. 1. You are going to be exposed to the Great Outdoors all of the time. When you live in Alaska, the outdoors is no longer an afterthought. Activities that take place outside become a part of who you are. Because there is plenty of sunshine deep into the night during the summer months, you will discover more opportunities to explore trails, kayak in bays, and embrace the explore waiting within. Even when the winter months come around, this attitude doesn’t change. You just learn to dress for the colder weather. 2. It is the perfect place to learn snow sports. If the cold weather of winter does bother you some, then Alaska might not be the perfect place to live. For those who do love playing in the snow, you won’t find a better place to learn a new sport. Skiing, hiking, snowshoeing, backpacking, and snowmobiling are all activities that will become part of your life when you move here. There are still the regular responsibilities that you have with life, like your job and going to school, but the outdoors becomes a third one that is a lot of fun to embrace. 3. Life tends to move a lot slower when living in Alaska. Have you ever heard of the concept called “Island Time?” When you move to Alaska, you will get to experience this slowing of life across the entire state. There is not the same level of hectic chaos here like there is in most of the rest of the world. You get an opportunity to embrace a slower pace in life that focuses on individual dreams. Meeting start whenever the people involved feel like making them happen. A deadline that is more of a suggestion then a finite term. There is nothing that you can do to change this perspective. People are going to take an individual approach to how they manage their time. Those who move here will either stress out because they feel like no one is being responsible, or they will take a deep breath and embrace the relaxed attitude. 4. Alaska offers you plenty of small-town charm, even in the big cities. Anchorage is the largest city in Alaska, was almost 300,000 people calling at their home. You will find plenty of cultural opportunities to explore in the community, with every amenity you would expect from an urban environment. It also gives you a chance to embrace the small-town charm that dominates the culture in the state. Outside of Anchorage, the next largest city is Juneau, with a total population of 32,000. Fairbanks is the home to 31,000 people. Then the next largest community is Wasilla, with just 10,000 residents. Once you live here for a year or two, it is not unusual to encounter someone you’ve never met, but they already feel like they know you. 5. You will not find better summers anywhere else in the world. Alaska has the best summers in the world. There isn’t an argument to make for any other location. Some parts of the state see nearly 24 hours of daylight during the season. When you’re living in Anchorage, the temperature tends to hover around 70° in July and August. That gives you plenty of time to start exploring the 300 miles of trails that are around this one city. There are several opportunities to pursue your sport of choice during the summer as well. Backpacking, canoeing, mountain biking, fishing, hang gliding, and so much more are available in Alaska because the summers are perfect for them. 6. There are numerous job opportunities available in Alaska right now. When you start thinking about the jobs that are open in Alaska, two industries come to mind immediately: the oil industry, and the natural gas industry. Commercial fishing is another occupation that many households practice in the state. Those are the only career opportunities that are available. When you move to Alaska, you will discover that there are military, transportation, healthcare, and construction jobs readily available. There are several positions that help to support the tourism industry in the state as well. That’s because even if you decide that living here isn’t right for you, a holiday visit still creates the perfect opportunity to relax. 7. You can get paid to live in Alaska once you qualify. Have you ever heard about the rumor that the government will pay you to live in Alaska? There is some truth to this idea that is percolating around the Internet. After living in the state for a full calendar year, residents will qualify for what is called the PFD payment. This dividend comes from a permanent fund that is fueled by the oil and gas industry industries. The payment in 2017 was $1,100 per person. That money applies to every person in your family, including the kids. If you are a married couple with four children, then you received a $6,600 PFT payment. For some families, that is enough incentive to make the move immediately. 8. You can save money in other ways by moving to Alaska as well. 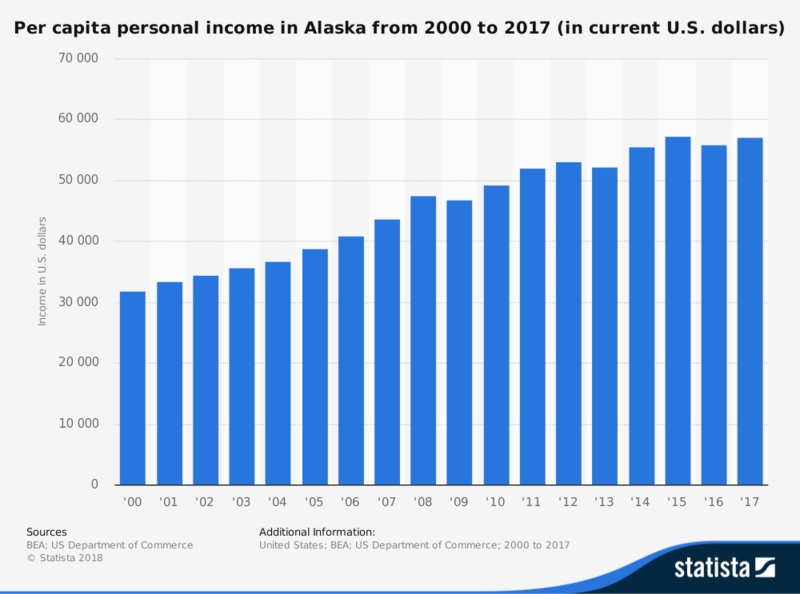 If you have talked to people about moving to Alaska, then you might have heard that retail costs are higher in the state. That is true because of the added transportation costs to move goods that far north. Many families can still save money because of how taxes are structured here. There is not a state income tax that is withheld from your paycheck. Local taxes tend to be lower than they are in the continental 48 states as well. That means you can have some extra cash to save for a new home, college tuition costs, or the outdoor toys you will want to use as you start exploring the millions of acres of wilderness. 9. Alaska puts you face-to-face with wildlife all of the time. It is not unusual to encounter wildlife every day when you are living in Alaska. Even if you make your home in Anchorage, there is an excellent chance that you will encounter a moose at least once per day. The trails in the city are closed frequently because of bear activity. Then there are the Northern Lights that you can see frequently dance across the sky all winter long. When you live in the state, then you are 15 minutes from being out in the wild, no matter where your home happens to be. That makes it a paradise for those who love to go hunting and fishing. These activities are taken to the next level when you move to this state. It is one of the few places in the world where someone with virtually no experience can still catch enough fish or hunt as a way to feed their family for an entire year. 10. Alaska is a business-friendly environment for entrepreneurs. 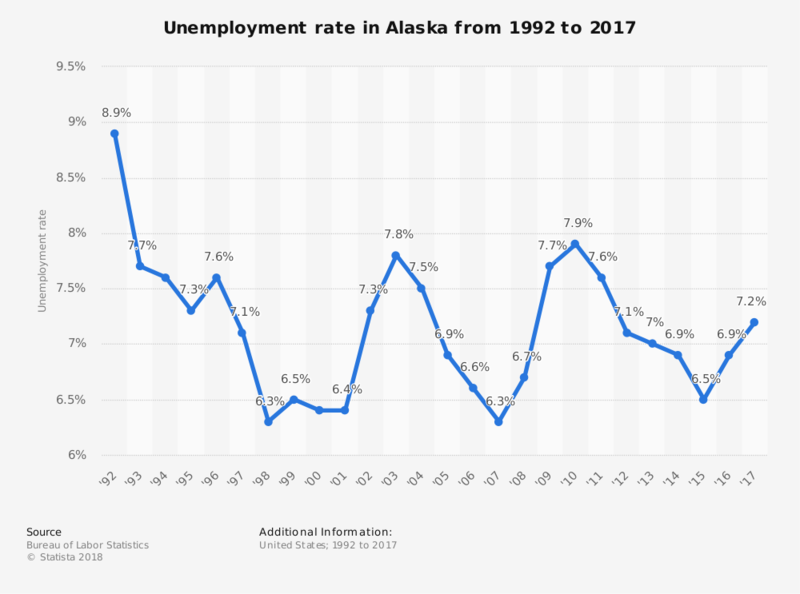 It is really easy to start a business after you move to Alaska. The process is online, allowing you to obtain your identity numbers and file your incorporation papers in less than an hour for most businesses. The fees for a business licenses are non-refundable, so if you make an error on your application, then you must pay for a second fee. Some communities have their own licensing requirements to follow as well. It is not unusual for you to start pursuing an idea today, and then be ready to start earning money in a week or two. There are even plenty of small business loan programs that are available to entrepreneurs that can ease the burden of start-up costs too. 1. Alaska is a state which deals with numerous earthquakes each year. There are about 5,000 earthquakes that happen every year in the state of Alaska. The strongest earthquake ever recorded in North America occurred here in 1964. In March of that year, Prince William Sound experienced a magnitude 9.2 earthquake. The state also experiences powerful volcanic eruptions from time to time, including the most powerful of the 20th century at Novarupta Volcano. This event helped to form the Valley of 10,000 Smokes at Katmai National Park. 2. It can get extremely cold in Alaska, even during the summer months. If you decide to make your home around Anchorage when you move to Alaska, then the weather will feel somewhat temperate. You’ll experience a shorter summer, but it won’t be a jarring difference. When you move further north in the state, that’s when the cold really becomes an issue. In 1971, temperatures drop to a record -80°F at Prospect Creek Camp. Numerous communities in the northern half of the state experience sub-zero temperatures throughout the year. Let’s take Fairbanks, Alaska, as an example here. The average high temperature for the city in the month of January is 0°. It gets a little better in February, but you’re still only averaging 13°. At the same time, you are experiencing an average low that is sub-zero. 3. There is a higher cost of living to consider before moving to the state. If you are not a household that was living paycheck to paycheck, then this potential disadvantage does not apply to you. It is essential to remember that costs are higher in Alaska. That is due to the higher cost of transportation and the isolation factor of the state. You might pay $6 for a gallon of milk instead of $3. If you shop strategically, especially with your rewards cards, most of the cost difference can be offset with a little creative budgeting. 4. Fuel costs are much higher in Alaska. Even though the economy of Alaska is fueled by the oil and gas industry, you will discover that the cost of gasoline is much higher than it is in the continental 48 states. Expect to pay about $.45 per gallon more for your fuel needs when you move to the state. That makes it the third-highest state for average prices in this area. Only California and Hawaii residents will pay more for their fueling needs. 5. Alaska is surprisingly far from the rest of the United States. Although there are plenty of flights that you can take from Alaska to the continental 48 states, the distance that you face becomes surprisingly large after you make the move. This disadvantage is especially noticeable if you happen to have a family emergency going on outside of the state. It is possible to drive from Seattle to Alaska in about 72 hours if you don’t make a lot of stops along the 1,000-mile trek. Even then, the cost of travel is going to be something that you will want to think about before you finalize any plans. 6. Don’t forget to budget your heating costs during the winter months. Because it is a lot colder in Alaska than in other states, your heating costs during the winter are going to be significantly higher. This expense is one of the most significant costs that you will face as a household if you decide to move here. You can limit this disadvantage by finding a home in or near Anchorage because there is a natural gas infrastructure that gives you access to this affordable fuel. For those who live outside of this metroplex, the only option tends to be heating oil, which is much more expensive. Some homes can get through the season using coal or wood with an interior stove to limit costs, but you will be trading time for money with that choice. 7. Snow removal is going to become part of your daily life. The frost-free growing season in Alaska lasts for about 100 days. That means you are going to be struggling with about the same number of days with snow each year. Even the southern areas of the state see higher levels of snowfall than most other locations in the United States. During the average year, Anchorage sees over 30 inches of snow from January to March. You may receive another 30 inches during the months of November and December combined. That means you are going to be doing a lot of blowing, shoveling, and plowing to keep your driveway and walkways clear. Depending on where you live, and how much snow comes in the season, you could find this process to be physically demanding and time-consuming. 8. You must become a business if you want to be self-employed. Because Alaska does not have an income tax, the state earns its revenues through a tax burden placed on businesses. It does have the fifth lowest sales tax in the country, and the state ranks first in overall tax burden for companies. If you want to work as a freelancer or be self-employed, then you must become a business when you live in the state. That means your tax burden is potentially higher than what it would be in some other states. The pros and cons of living in Alaska involve what you are willing to embrace so that you can have year-round access to all of the outdoor opportunities that exist in the state. There are times when the weather and the costs of living here will be challenging. Most people find that the rewards far outweigh whatever sacrifices they may need to make. You can embrace the life, or you can try to fight the elements.